Dying Easter Eggs is a tradition spanning centuries in many countries throughout the world. 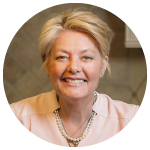 Last year, a dear friend, Agnes Fuller shared with me a fun-filled day of cooking. 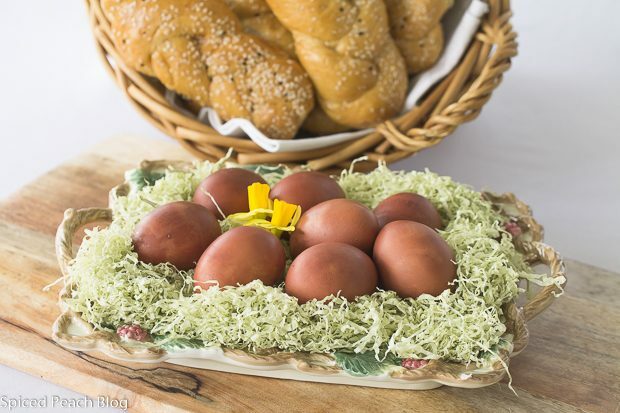 We prepared foods based on the Armenian cultural traditions of her family for the Easter Sunday celebration. Besides Armenian Rice Pilaf, we prepared Armenian style Easter eggs using collected onion skins as catalyst for the dye. The food was delicious, along with a shared bounty of Armenian style breads, cheeses, stuffed grape leaves and olives. 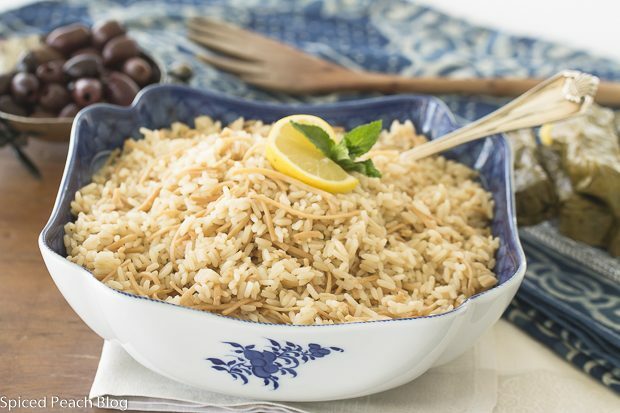 And the Pilaf preparation, more than a common dish shared by many in the European-Middle Eastern tradition, is to Agnes, a time of prayerful contemplation, each task within the cooking process used as a sort of beatitude in gratitude to the flavorful finish. During our time together it was fascinating to observe how cultures of people from a simpler past, perhaps even with little money, developed and evolved creative traditions, such as dying eggs in natural shades of color just by saving up and using the skins of onions. This was one way people created their own living acknowledgment of the Easter celebration, the emergence of new life. As with all things there are of course, some creative twists often used in the egg dying process, including multiple variations of patterns and designs while coloring, but due to our time constraints at the end of the day we agreed to utlize the basic Easter Egg onion skin dyeing technique for sharing. I thought the Armenian Style Dyed Easter Eggs were naturally lovely. They also serve a symbolic part in the cultural heritage between families of generations. 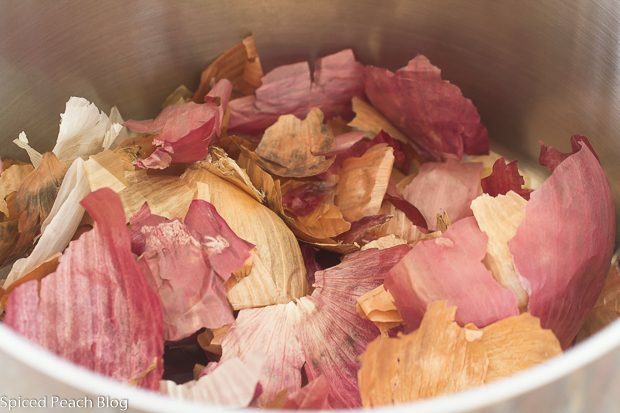 Onion skins for dyeing eggs have and continue to present one sort of purposeful core of tradition, the saving and collecting of natural bits, those people ever mindful of bringing forth the celebration in signifying their faith on Easter Sunday. Layer the bottom of a soup pot with one-third of the onion skins. Nestle 6 of the eggs on top. Gently add enough cold water to just cover, layer on another third of onion skins followed by 6 more eggs. 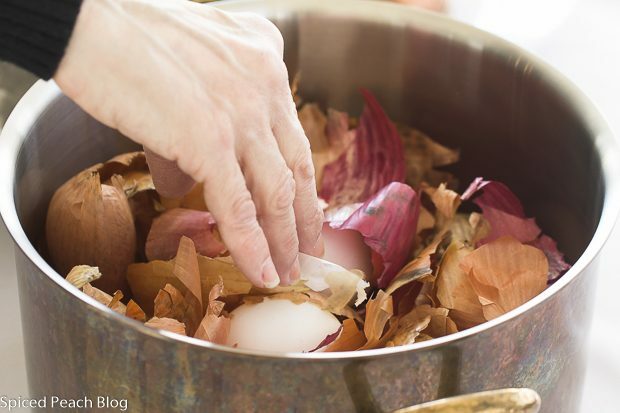 Cover eggs with the remaining onion skins spreading evenly across the top then gently add enough cold water to cover the top by an inch or two. Pour in the vinegar, sprinkle over the salt. On medium low heat bring the water to a gentle boil, reduce temperature to low heat and continue boiling for twenty minutes. 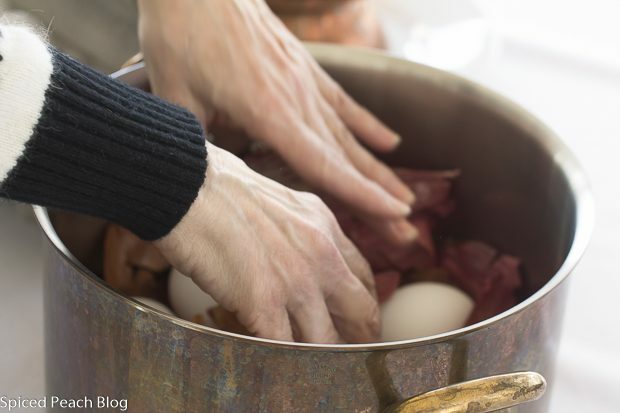 Turn off heat and let eggs set in the pot for fifteen minutes before carefully running cold water in the pot, discarding all of the skins. Eggs will be dyed a reddish hued color. For lighter shades or a natural marbled look use fewer onion skins and rinse eggs just after turning off the heat. This entry was posted in Foods Around the World, Holiday Favorites and tagged Armenian Dyed Easter Eggs, Armenian Style Dyed Easter Eggs, Natural Dyed Easter Eggs, Onion Skins for Coloring Easter Eggs. Bookmark the permalink. Post a comment or leave a trackback: Trackback URL. I remember this. So interesting. Happy Easter, Peggy, to you and your family. Hi Mary! Thanks so much! You have a good memory. 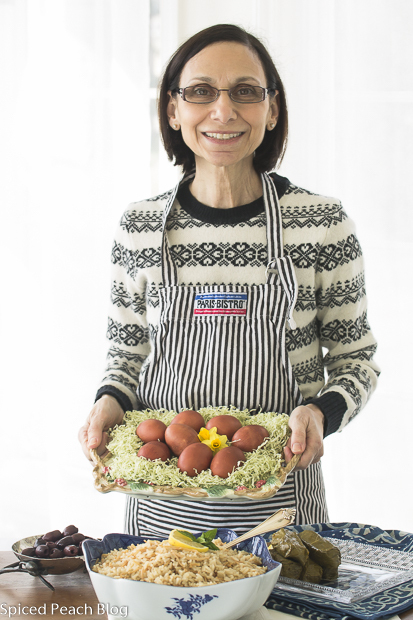 Yes, last year I featured Agnes with the Rice Pilaf as part of the Armenian Easter Dinner tradition but- I missed out on the timing of sharing the eggs- so I’m happy to have the chance to share them this Easter. Enjoy your holiday in Paris! Happy Trails and Big Hugs! I have a bag full of onion skins – saving them for just this project. I have been meaning to hunt up a recipe– thanks!! What a lovely tradition, Peggy. Happy Easter to you and your family! Hugs. Hi Kelly, Indeed it is a lovely tradition and I love the versatility options using “natural dye” Hope you had a Happy Easter!